Coryphantha, commonly known as Beehive Cactus, is a genus of small to middle-sized, globose or columnar cacti. They are native to arid parts of Central America, Mexico, through Arizona, New Mexico, and western Texas and north into southwestern, central and southeastern Montana. With its 57 species and 20 subspecies, it is one of the largest genera of cactus. The name “Coryphantha” is from Greek and means “flowering on the top”. Most species where at one time included in the genus Mammillaria, but they differ primarily in that Coryphantha flower from the first year growth at the apex of the plant, while Mammillaria do not flower from new growth and instead flower in rings further down the plant in mostly second-year growth. In cultivation, this genus is not at all rare, but often plants exist without adequate identification. This is especially problematic because Coryphanthas are quite variable from seedling to mature age plants. Likewise, the presence of a central spine and/or extrafloral nectaries is variable even in mature plants. In this way several plants of the same species may appear quite different based on their age or expressed traits. If you can grow cacti and succulents successfully, you can likely grow Coryphantha without too much trouble. Coryphantha love to be in a very bright exposure, but generally not to direct light of sun. The risk, especially during the hottest hours of the day and during the summer, is to get sunburned. The average winter minimum temperature, in general, should not fall below 40°F (5°C), unless individual exceptions. Adult plants (at least 2 years of age) can withstand frosts also very intense, but only if the temperature rises again quickly. To encourage better flowering, allow the plants to enjoy a cooling period in the winter and suspend watering. Allow the soil mix to become nearly dry between waterings, but then water thoroughly. Immaculate drainage is essential, so never let the pots sit in water. Suspend watering in the winter, but mist occasionally. 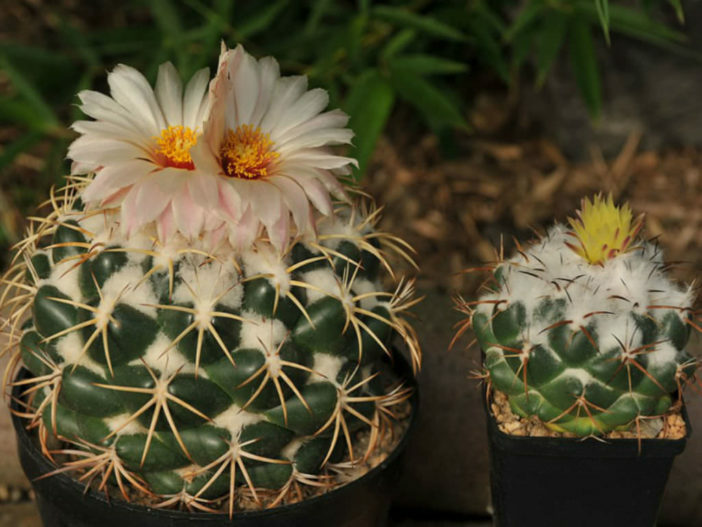 This cacti are very susceptible to rot and therefore require a well-drained soil. Use potting mix that is labeled for cacti or succulents. Coryphantha cactus is slow grower and don’t really need much fertilizer. Just a couple of times per year will do. But if you want to fertilize your cactus regularly, do so in spring and summer with a general-purpose fertilizer formulated for use on houseplants. Follow the directions on the packaging. Repot as needed, preferably during the warm season. To repot Coryphantha, make sure the soil is dry before repotting, then gently remove the pot. Coryphantha are usually propagated by seed.